Graduation time is upon us and that means parties fools... but if you've got time to check out some shows... Soul Position the collabo of Blueprint and RJD2 will be at Emo's on May 13th as part of their Thing Go Better Tour! Also at the show will be One Be Lo ! get your tix here! 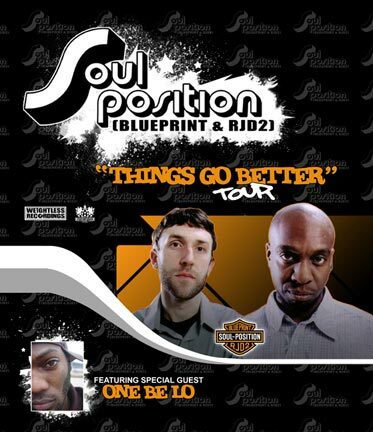 On paper, Soul Position, which is the collision of Blueprint and RJD2, looks like hip-hop's next big supergroup. When he's on, Blueprint's voice wraps around beats with an aggressive elasticity reminiscent of a young, hungry Del, utilizing clever wordplay and conveying a personable honesty. He's carried an underground buzz for the better part of a year and Urb magazine recently tagged him as one of the "next 100". And RJD2-- do we really need to recap this man's accomplishments of late? To paraphrase the esteemed Big L: if production was a game, RJ would be MVP.